„Wild West Reloaded“ is an ironic movie about the image of american history that media presents to the public. The genocide and disappropriation of the native Americans are compared to the war in Iraq. 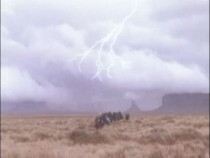 The original uncutted audio of a CNN broadcast is mixed with images of a classic John Ford Western movie.